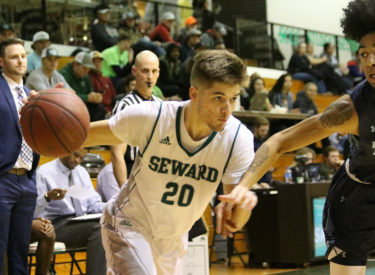 LIBERAL, Kan. – The Seward County men’s basketball team picked up an important late season win over the Colby Trojans Wednesday night, 71-56 inside the Greenhouse. Trying to close the gap between teams ahead of them in the standings, it marks the second straight win that the Saints have been able to gain one game on those teams. The Saints (16-12, 12-12) came out with high energy and won the game without allowing Colby to ever gain the lead. Seward started the game on a 7-0 run, holding Colby to without a basket for the first three minutes. Seward started another scoreless drought for the Trojans following the made basket, keeping them from scoring for the next four minutes of the game, while going on a 5-0 run. The Trojans could never get their feet under them, as the Saints had an answer for everything Colby did. With just over three minutes to play in the half, Isiah Small connected on a midrange jumper to put the Saints up 17 points by a score of 36-19. The lead stayed at 17 for the remainder of the quarter, with Seward taking a 41-24 lead into halftime. Seward shot 50 percent (15-30) from the floor in the first half and 44.4 percent (4 of 9) from behind the arc. While Colby shot 41.7 percent (10 of 24) from the field, Seward held the Trojans to just 16.7 percent (2 of 12) from deep, while forcing 12 turnovers. The Saints came out and pushed their lead to a game-high 22 points by a score of 50-28, but the Trojans quickly trimmed that lead down. A 10-0 Colby run put the Saints lead at 12 points with just under 12 minutes to play. A 5-0 run started by Hegel Augustin gave the Saints a 17-point lead again, just before the media timeout. The 17-point lead proved to be too much for the Trojans to overcome. Colby trimmed the lead to 12 points with 1:22 to play, but free throws by Small and Ke’Sean Davis put the game away for the Saints, picking up their second straight win, 71-56. Seward finished the game shooting 48.1 percent (26 of 54) from the floor 30.8 percent (4 of 13) from deep. The Saints held the Trojans to 40.4 percent (23 of 57) from the field and 19 percent (4 of 21) from behind the arc. Colby turned the ball over 21 times, with 11 of them coming off Saints steals. Small came away with a double-double in the win, scoring 25 points and grabbing 11 boards. Davis joined Small in double-figures, ending the night with 16 points. The Saints will return to the Greenhouse on Saturday, February 24 to take on the Dodge City Conquistadors at 8:00 p.m. for Sophomore Night. The game will be free for all fans thanks to our sponsor Sharp McQueen. Free tickets can be picked up at Sharp McQueen and both Pizza Hut Locations.